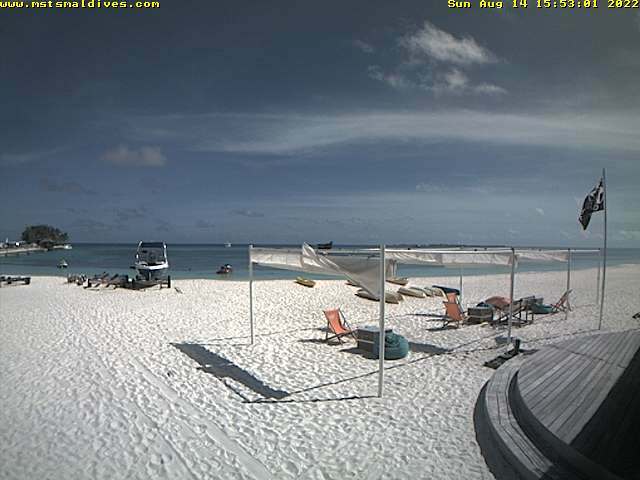 This webcam is located in the area of the largest water sports center in the Maldives – Ocean Watersport on the island of Kuredu. In the foreground of the webcam you can see a wooden platform with tables where guests of the center can drink refreshing drinks between sessions of water sports, before or after an interesting sea excursion, and also get instruction before new practical lesson. The center of Ocean Watersport is perfect not only for professional sportsmen, but also for absolute beginners, because in addition to professional equipment there are first-class instructors who can find the right approach to each client, regardless of the level of possession of a particular sport. A little further you can see additional tables and soft pillows on a sandy beach where it is convenient to spend warm Maldivian evenings. Favorable weather with a lot of sunny days a year and a stable wind rose allows you to get excellent theoretical and practical skills of managing a sailing catamaran, ride a board with a sail (windserfing) and even combine flights over the water with slip on the waves thanks to kiteboarding. After passing a certain number of lessons and fixing them in practice, it is possible to obtain the corresponding international certificate. Of course, such popular sea entertainment as water skiing, parasailing and kayaking can also be found on the island of Kuredu and get an unforgettable experience of riding along the crystal clear water surface. The Maldives webcam from Ocean Watersport’s water sports center in Kuredu is open 24 hours a day, but an online slideshow is broadcast with a photo update every 60 seconds. If your Internet browser does not update the picture automatically, you need to refresh the page. Enjoy watching!